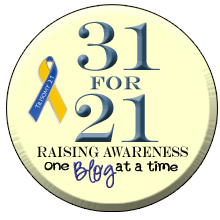 People often ask me about Alex’s family and acceptance. 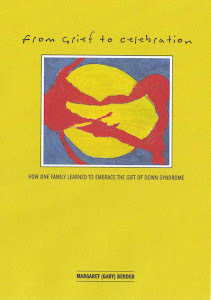 To that end in 2009 I asked my four siblings, and Alex’s two siblings to share their reflections on Down syndrome. John and I also contributed. For these two weeks I will be sharing those reflections in no particular order. This second reflection was published on March 8, 2010. My sister Mary Beth is seven years younger than me. Our age difference was just enough that she was able to live with me during her summers away from college. We were able to spend a lot of time together before marriage and kids…Ah for the good old days. Mary Beth is last of my siblings to respond to my overt request for material for this journal. MB (or Mubba as we call her) is very organized and usually would be the first to respond. In this case, I think she might have been distracted by her pregnancy and newborn. Jill joined our family, and her three siblings, in late January; a new baby is the best. Aunt Mary Beth is Alex’s god mother, and she takes this responsibility very seriously. As she relates, she has developed a special bond with Alex. Alex adores her. Alex is my God child. To her I am simply Aunt Mary Beth. Although when we are joking I encourage her to call me God. That makes her laugh. When Alex was born I just knew she would be an exceptional girl. She has exceeded that. She is remarkable and truly special to all who know her. To know her is to love her. On the topic of laughing, Alex is so fun to joke with. She understands all jokes and really appreciates them. What a good sense of humor she has. Last time we were at her house she was into the movie Grease. I tell her all the time she is electrifying, just like the movie. She laughs and says "Oh Aunt Mary Beth you are funny". Alex loves funny things and really brings so much joy to the room. As my God child, every year for the holidays I give her an ornament that signifies what she loved of that year. She has received a skier, skater, guitar, student, just to name a few. All have her name and year on them, so when she grows up with her own holiday traditions she will remember what is special for that year. Every year is special to Alex that is a great thing. Alex is so full of love for everyone and all she does. Recently when we had a new baby my family was talking about who would come out to help. My kids all voted on Alex because as they said she "would love the baby the most". My kids forgot for a minute that Alex would not be able to drive car pools and had school to attend. But when they thought about who would love on the baby the most Alex was the first that came to their minds. A tremendous compliment to Alex and the love she has for everyone. She feels the love, and everyone around her feels the same love for her. Alex really enriches our extended family. Without her things would not be as bright, love filled or fun. What a gift Alex truly is to this world, but especially to our family. Like I tell Alex all the time, she is ELECTRIFYING! Yes, Alex is electrifying, magnetizing and very lucky to have such a great family.